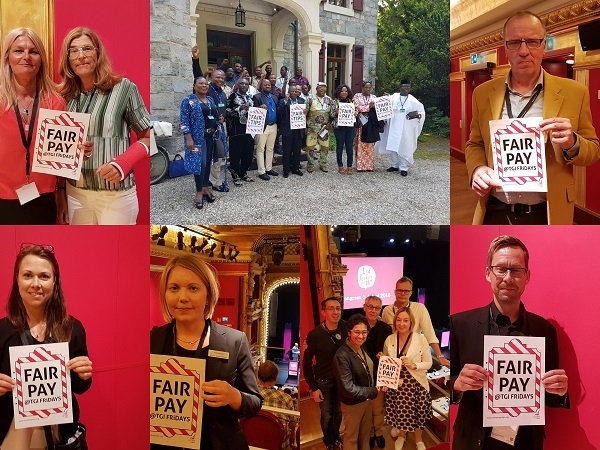 A series of well-publicized strikes (click here, here and here for more) over tipping and minimum wage abuses by workers at TGI Fridays in the UK and a sustained campaign by Unite supported by the IUF have achieved important initial results. TGI Fridays management has announced it will reinstate staff meals and pay for unpaid workplace trials and online training. The Tronc/Tips Committee will be re-established and the division of tips between waiting and kitchen staff, one of the issues which ignited the strikes, re-adjusted. The strikes and demonstrations have pushed the Labour Party and now the Conservative government to commit to legislation ensuring hospitality staff receive 100% of customer tips. Unite is organizing to ensure effective legislation, with the involvement of affected workers. 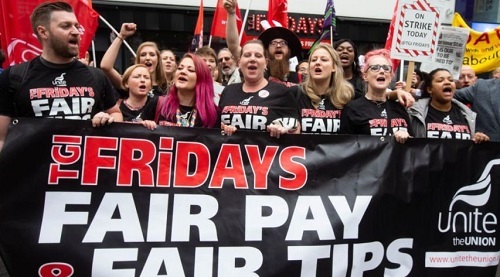 The TGI FRIDAYS conflict has also highlighted the weaknesses in UK employment law which deny legal status for workers who submit collective workplace grievances. Unite is organizing to ensure that the right to raise collective grievances is recognized as part of the right to freedom of association, in conformity with the UK Human Rights Act.